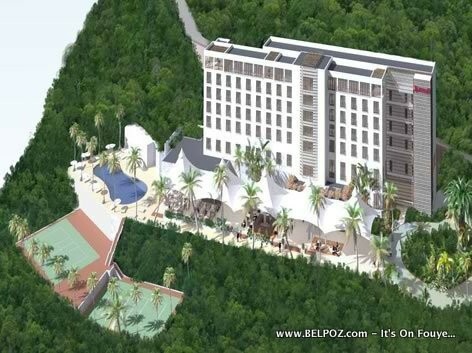 Port-au-Prince, Haiti: Digicel and Marriott International (NYSE: MAR) today broke ground on the $45 million 175-room Marriott Hotels & Resorts brand hotel in the Turgeau area of Port-au-Prince, with opening expected in early 2015, making it the first four-star branded hotel in Haiti. The hotel sets a new standard of excellence for the growing number of business travelers coming to Haiti, combining a friendly, professional and safe environment and offering the exceptional service that Marriott International offers worldwide in all of its properties. The hotel is especially suitable for business meetings, conferences and events and will feature the most up-to-date facilities in the city. The ballroom will comfortably accommodate around 380 people for dining and around 500 theatre-style. The 175-room Marriott Hotel Port-au-Prince will include five suites, a casual restaurant with private dining area, fitness center, swimming pool and a great room lobby that inspires creativity, productivity and social interaction with its conveniently dispersed zones including a bar and lounge. The property will also have a gift shop and marketplace and will offer guests 24 hour room service, WiFi and secure parking.